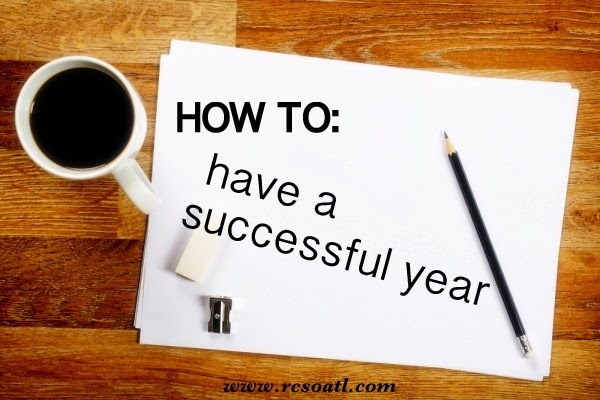 What should I do to have a successful year? Some of the people who asked are college students, some are recent grads, and some have been working for 20+ years. One thing that we all have in common? We all have dreams. And we all appreciate that 2014 is a clearly defined fresh start date. This new year means a new opportunity to out-do 2013 and everything involved in that year. 2013 was by no means perfect. But it was definitely a successful and happy year for me. The achievements outweighed the failures (in my eyes), and I grew so much as a person and blogger. 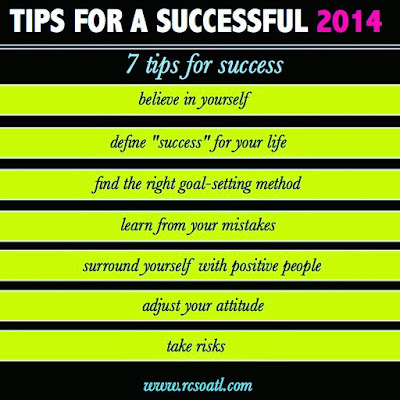 I'm sharing some of the tactics I used in 2013 to make it as great as possible, and I'll be using these same tips to make 2014 even better. I have really exciting, crazy and outlandish goals for this year (and I'm starting grad school next week) so I know that I need to organize if I want to make it all happen. When it comes to confidence, we can be our own worst enemies. I used to scare myself into believing that an entire year couldn't be successful, happy, and enjoyable. But in 2013, I vowed to be my biggest supporter instead of my own devil's advocate. I thought of all of the good things that a new year could bring, instead of what could go wrong. Having others back your dreams and believe in you is meaningless if you don't fully believe in your dreams and plans for this year. I don't know what all I have planned for this year, but I do believe that I can do it all. Believing in myself was a major part of my success when it came to tasks such as graduating and starting a new job. Believing I could do all of the things I reflected on was the first step in succeeding in 2013. As I said earlier, 2013 was a successful year in my eyes because I achieved goals that were really important to me and because I maintained my happiness and sanity throughout all of the ups and downs. Success, like happiness, is a personal experience and emotion that only you can determine for yourself. Even when others would point out something I'd achieved, it felt irrelevant because I used to constantly compare myself to others. My goals never felt good enough. But in 2013, I stopped competing with others and started competing with myself. It was a game changer. While I do acknowledge and praise the achievements and successes of others, I don't allow those people to deter me from my own path to success. A goal without a plan is just a wish. People seriously underestimate the power of a goal setting method that works for their particular lifestyle. This year I listed out promises to myself, I'm working on a list of fun to-do's for being 23, and I also have a really personal list of goals that I keep written on paper. (I also believe in keeping a few goals to yourself). Different methods work for different people. You have to find a way to list, keep up with, and celebrate your goals in order to make them realistic. To-do lists don't work for everyone! Little known secret: Mistakes come packaged with success. Before the success happens, the mistakes happen. Getting it right on the first try wouldn't be much fun, anyway! Every year I have fewer and fewer friends. Sometimes because we drift apart, but recently it's been by choice. If your friends aren't helping you grow, encouraging you, or challenging you to be a better person…what are they doing? Many people have everything it takes to be successful, but they're surrounded by "friends" who are secretly hoping for their failure. Weeding out the toxic relationships and negative people in your life is challenging and not always fun. I do miss some of the old friendships, but now I see why they had to end and I'm appreciative. And, I believe that my friendship alterations were crucial for my motivation, happiness, and success for the big and small projects of 2013. I now have a great set of really close friends who are all ambitious, supportive of my dreams, and positive sources of energy and feedback on personal and professional issues I may have. During my job in 2013, I quickly learned the importance of being flexible and capable of an attitude adjustment. Things happen. And sometimes things don't happen the way we'd like for them to happen. The difference between a successful person and unsuccessful person is how she reacts when unexpected "things happen." In 2012, I quickly got frustrated when something on my to-do list didn't get done, when another person interfered with my plans, or when my plans for something didn't turn out just right. But in 2013, I learned how to adjust my attitude - and quickly. As you go through 2014, expect the unexpected. And be prepared to make an attitude adjustment. Dwelling in disappointment or failures is a waste of time and energy. Make this year a success by standing up quickly when life knocks you down. Adjust and readjust that attitude. The successful people who we all admire aren't just sitting around waiting for wonderful things to happen to them. They're busy making things happen and taking risks. I definitely took risks in 2013 by applying to jobs, by emailing sponsors requesting a partnership or collaboration with my blog, by going on a sort-of blind date that led to a relationship, by investing money for my company, by submitting my grad application to just one school, by choosing grad school over working full-time, and by writing some personal blog posts. But looking back on it, those risks are the reason why I count 2013 as a win. Those risks gave birth to the achievements. Those risks made 2013. I'm taking even bigger risks in 2014, and expecting even greater outcomes. I'm already head over heels in love with 2014 because of its potential for a type of success I've never seen before. What are you doing in 2014 to make it a successful year? These are all such great goals! Thank you for sharing this! love this post!Thanks for the wonderful advice! Happy New Year! Best wishes for a wonderful 2014! Taking risks is HUGE. It can be scary but some of the best things can also happen when we take a leap of faith. Wonderful ideas! I really like #3! Thank you for the post! I really struggle with 1, 2, and 6! One of my goals this year is to write down what I am thankful for everyday. I hope that will change my attitude and help me believe in myself.